Today for #SundaySupper our mission was to make a meatless meal. I have no problem with that considering I make meatless meals all of the time. But I gave myself a little mission, make a meatless meal and see if my Husband will eat it. 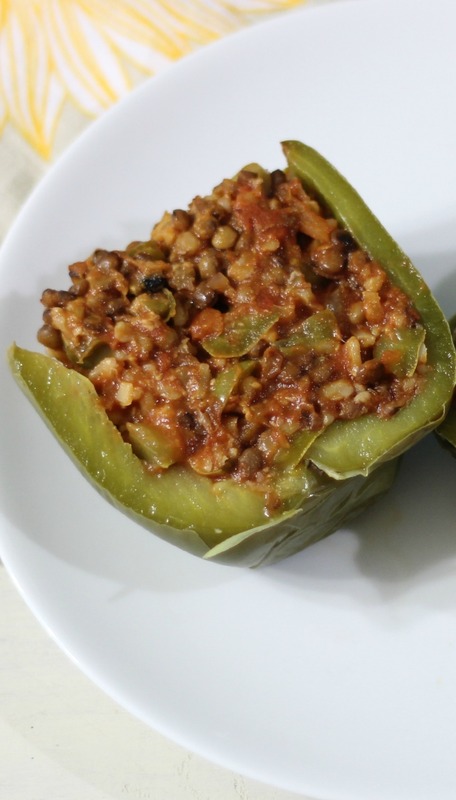 So today’s recipe is Lentil Stuffed Peppers. One thing I have to tell you first; is that my Husband LOVES my beef stuffed peppers, it’s one of his favorite meals of all times, next to homemade chicken noodle soup. So can I get a way with making one of his favorite meals with lentils? Between you and I, besides a little texture difference, I didn’t notice the difference between traditional beef peppers and lentil peppers. 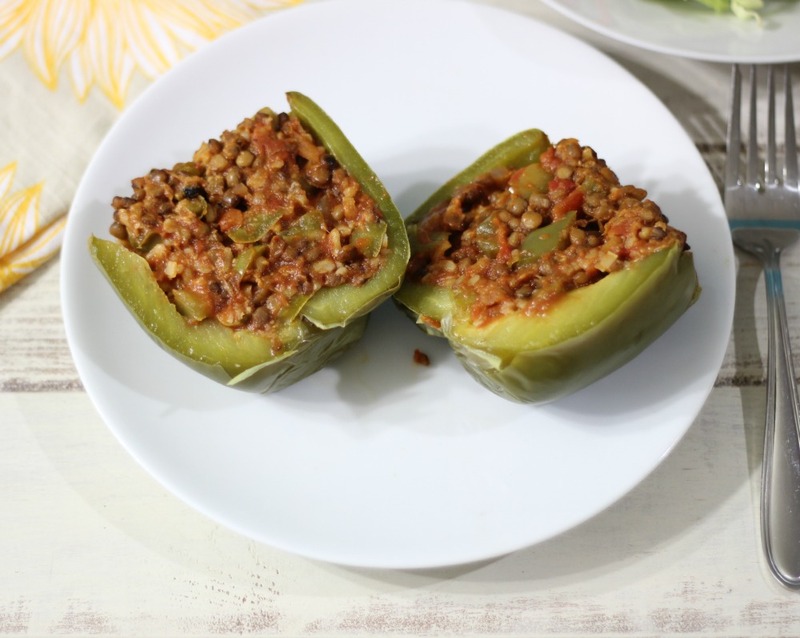 I love this dish and I love that they are fewer calories and have more fiber then traditional stuffed peppers. This is a very filling dish!! Since the recipe makes 5 peppers, I have leftovers for lunch for a few days. Yah!!! I cheated when making this meal. I used Trader Joe’s Already Cooked Steamed Lentils. I was crunched for time and I wanted something quick, plus I needed to use them. I do love those lentils, but you can always make your own! I have yet to make homemade lentils, but plain on doing it soon. I have a few boxes of it, I just need to do it!! Cut tops from the peppers; discard seeds and membranes. Chop the pepper tops; set aside. Place the whole peppers in boiling water for 5 minutes. On a paper towel, invert peppers and let them drain. In a large skillet over medium low heat add olive oil, onion, diced pepper tops and cook until tender. Add un-drained tomatoes, rice, ½ cup of water, worcestershire sauce, parmesan cheese and a dash of pepper. Bring to a boil, reduce heat. Cover and simmer 15 to 18 minutes or till rice is tender; stir occasionally. Add lentils and cheddar cheese and stir until cheese is melted. Stuff peppers with lentil mixture and place the peppers in a 10 x 6 x 2 inch baking dish. Cover the baking dish with aluminum foil or a lid and bake for 30 - 35 minutes. I love making traditional meals and subbing it with things like lentils and quinoa and trust me if I could have gotten away with this, I would have added quinoa instead of rice, but I could only push the limits so far. Baby steps as I always say! I can’t wait to see what the #SundaySupper crew makes for their meatless meals. I can always use more meatless ideas! Well my Friends, have a super fab Sunday!! Life is too funny, isn’t it? I appreciate the irony of all our best laid plans going another way. However, it sounds like it was a big win-win in the end. As a mostly veggies, tofu and/or fish for dinner person, you know I’ve clipped your recipe…and am looking forward to the thumbs up from my husband! I was giggling to myself as I read your story, my husband would have done the same thing, he always eats whatever I made but I can tell when he likes or dislikes a dish! I’m going to try this and see what happens!! Thanks for the awesome new recipe! Baby steps, girl. You did well, on every count! Your husband sounds like mine! Except sadly my husband doesn’t like stuffed peppers. But I want to try this filling stuffed into some zucchini. I cooked a froze a ton of lentils for quick lunches for the baby, so this might be an upcoming Friday dinner during Lent. I love the idea, stuffed in zucchini boats. I am going to try that! I love the idea of freezing lentils too! Ok, for sure I am making lentils this week and freezing it! Ahhhh, thank you Roz! I enjoy your blog!! I know I can’t get over how much protein and fiber there is in lentils. I love them!! This one is a definitely mark in the win column, Jennifer! Maybe next time, go half and half with the meat and work your way back to all lentils again gradually. 🙂 That filling looks absolutely delicious! That’s a great idea Stacy! I am so going to do that when I make a meal like this again! ha ha! You just never know!! Yes hide the prep work!! It’s awesome your husband enjoyed these peppers! Homemade lentils are actually really easy to make. You have to try them – I know you’ll be really happy with the result. I have to make homemade lentils, I just get lazy. I have a few boxes of it, maybe this week I’ll make some? I’m curious to the difference between homemade and Trader Joe’s. We LOVE lentils! I have no doubt we’d love your peppers, too! You should try them Melanie! They are so good! I know! He just gets scared. When I make anything, he asks whats in it. I have to always tell him it’s normal dear, nothing funny tonight! Ahhh my husband is the same… I can only feed him meatless meals if they are pasta based… sigh! I love lentils though and I am sure these peppers tasted amazing! My Husband will eat veggie pasta, but I keep frozen meatballs in the freezer so I have them to just make him happy. He was a pretty good sport about it and he did eat it. If it was quinoa he wouldn’t have touched it. But lentil are really a good sub for beef. I love getting picky omnivores to eat veggie dishes. This one looks fantastic, I don’t know who could turn their nose up at these! 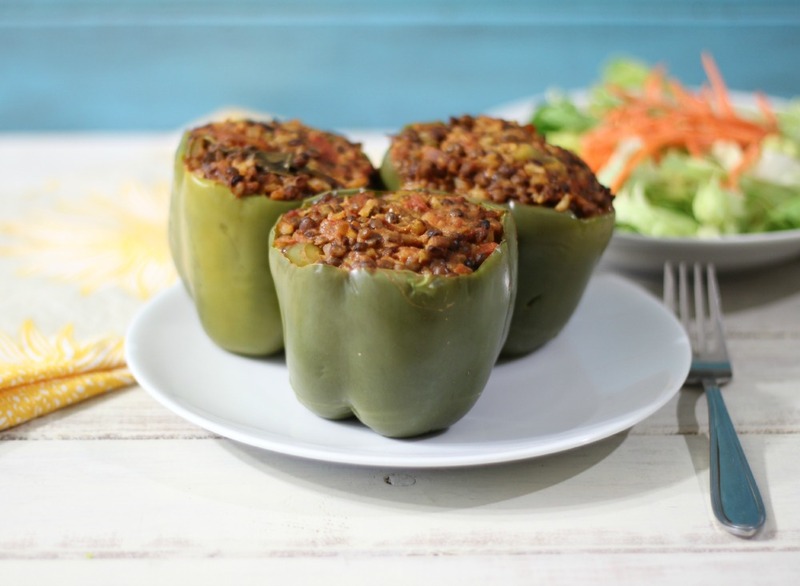 Oh, stuffed peppers are one of my fav vegetarian meals! I’ve actually never made them WITH meat, can you believe it? I usually use couscous for mine, but I love lentils SO much. Must try your version soon! I want to try them with other veggies and quinoa. I just love stuffed peppers, but I am sure you know that. You have to try the lentil version, it’s so good! Haha, you are so funny!! I am always trying to sneak things like this past my husband. 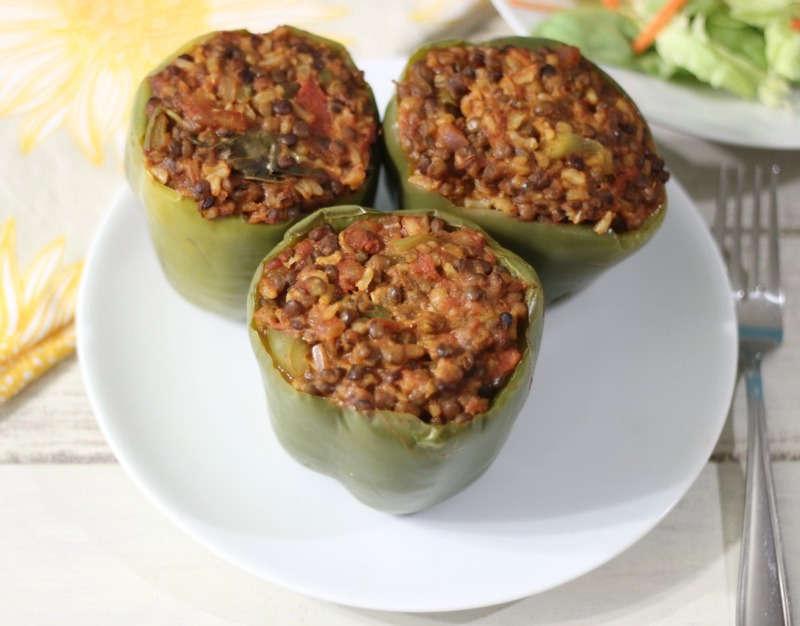 These peppers look DELICIOUS, I never thought of filling them with lentils, what a great and healthy idea! I love it! We are always looking for new ways to stuff peppers. This filling sounds will be next on our list! Oh how I love lentils! I think I could eat a bowl of just the stuffing. Great way to sneak it in and get your husband to try it. what a great idea!!! and it looks sooo good! 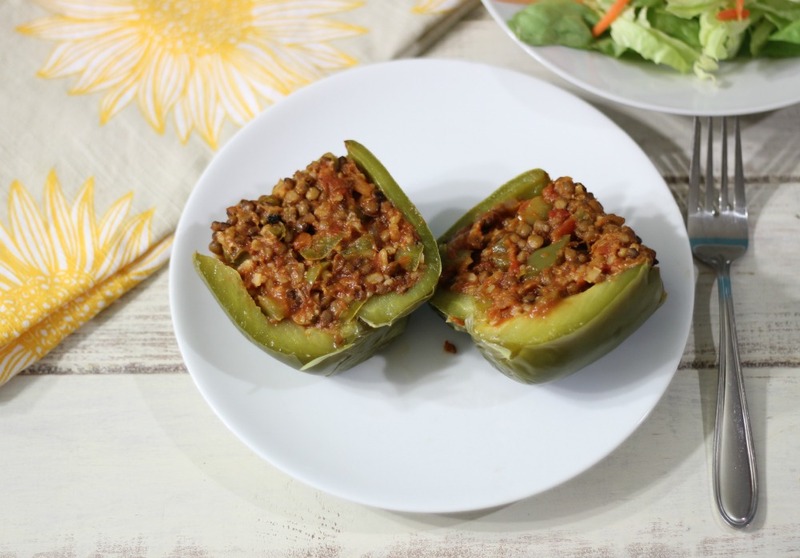 can’t wait to try your lentil stuffed peppers! yummmm! Even though I’m not a fan of peppers, that filling is a winner in my book! Ooohh I loves me some stuffed peppers and these sound amazing! Lentils are our favourite meat substitute. It has such a meaty flavour it is perfect in things like a bolognese sauce that you normally add beef. I love these stuffed peppers and that in spite of the verbal protest hubby seemed to enjoy it. Ohhhhh bolognese sauce and lentils, love that idea!! These look so good Jennifer! I love stuffed peppers, but I’ve never made a meatless version. Great idea! The only thing I need to add here is that Worcestershire Sauce is not vegetarian nor vegan. Few know that it has fish in it… Anchovies to be exact. Trying this recipe with brown rice and quinoa…sounds yummy! Thank you! I thought this was a nice change up from regular stuffed peppers. These were so so so good and filling. Cooking the rice with the tomatoes and pepper pieces slowly brought out all kinds of crazy good flavors. Today is leftover day, and I’m watching the clock until it’s an acceptable hour to stuff my face with peppers. I used red peppers and all parmesan, and added fresh oregano and garlic. I’m sure the recipe would have been delicious as-is, but I was trying to use up some odds and ends. Instead of boiling then baking the peppers, I put them in the crockpot topped with tomato paste. I needed a lot more water to cook the rice completely. It took about 45 minutes but was well worth it. I ate a bowl of the filling while I waited for the peppers to cook. Mmmmm. Hi Audrey, Wow! Your so funny and adorable. You get as excited over food as I do. I so love that you put it in the crockpot, great idea. All the little extra ingredients, I bet they tasted amazing! Yum!! Now I want stuffed peppers. Do you think these would hold up in the freezer? Just looking for quick dinner ideas. I’m a vegetarian and very busy and its hard to not default to quick pasta dishes all the time. This would appeal to the boyfriend too, he’s trying to be a healthier but not the most proficient cook. Thanks in advance! Hi, it should be ok. I have frozen peppers before. However, The thin layer of skin on the peppers may peel, but that’s not a big deal. It should work out great for you. Great idea for time saving meal. what is the measure of Dry lentils before cooking? Hi Gayle, I am not sure. Honestly I never cooked with dry lentils. I will see if I can figure out a measurement for you. For this recipe, I used the already cooked lentils from Trader Joes. OMG laughed totally out loud this article is so funny! My boyfriend is exactly the same right down to calling the lentils “balls” lol made these tonight they were fantastic! Great recipe and super funny on point writing! Love your blog! Ha ha! I know the little lentil balls. Too funny! Glad you enjoyed the stuffed peppers. Mmmmm! I’ve always been a fan of eating a lot of meat-filled peppers but I’m switching over to veggie-only dishes and these look delicious. Thanks so much! I made these last night and substituted cauliflower rice for brown rice. Very good and filling. My husband and daughter ate them as well. Great option for vegetarians and meat eaters as well!! What a great idea! I am going to try that. Love that! Thank you for the suggestion. Good recipe, but the rice is wrong…. Wrong!! I’ve made this twice now and the rice does NOT get done using the instructions stated here. The rice either has to be made separately and added into the tomato mixture later, or maybe white rice substitued in place of the brown so it gets done in the time frame given. Other than that, great flavor. Even my teenage son – whose main goal, I believe, is to eat only junk food – enjoyed it.